One evening, Emily Brown and her old grey rabbit Stanley hear a Thing crying outside their window. The poor Thing just can’t get to sleep, so Emily Brown and Stanley set off on incredible adventures to the Dark and Scary Wood, the Whirling Wastes and beyond, to find the Thing’s cuddly, his bedtime milk, and his medicine… but nothing seems to help him settle. What’s really troubling the Thing, and will anyone ever get to sleep? Parents and children the world over will recognize all the bizarre excuses a child can make to keep the light on and a parent in the room at bedtime, and this story has a gentle message that there’s really no need to be scared of ‘Things’ in the night. 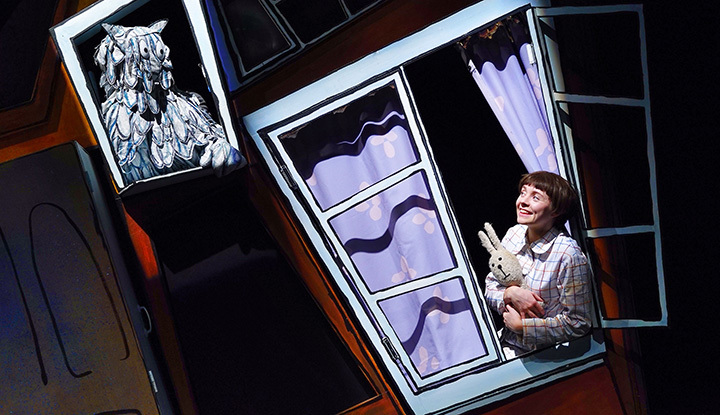 Touching on themes of fear, bravery and adventure, this production has great songs, clever puppets, and characters that audiences of all ages will adore. Join us for this magical musical show, based on the much-loved book by Cressida Cowell (writer of How to Train your Dragon) and Neal Layton.